How about this for a not-so-catchy theme song? 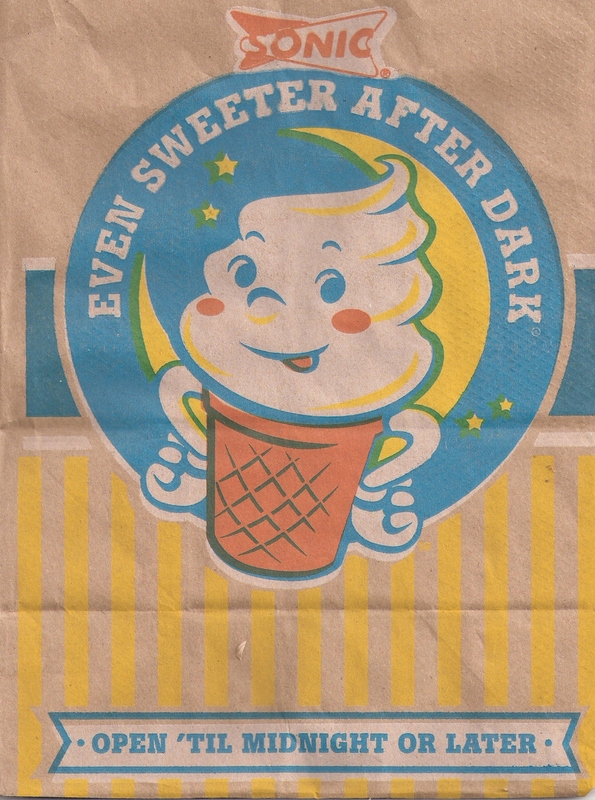 OK, I’m not really doing this every week, but my retro award of the week goes to Sonic drive-ins for the artwork from their latest promotion, “Even Sweeter After Dark”. The ice cream cone image taken here is from my paper sack from yesterday’s lunch at Sonic (yes, I scanned my trash). This little guy makes me happy! The image is very reminiscent of the logo from the Fosters Freeze chain in Southern California. It also reminds me a lot of the old drive-in intermission snack bar commercials. Bravo, Sonic! Some things are apparently meant to be – like my job. I have worked for State Farm Insurance for going on 20 years, and I have been a tremendous Jack Benny fan since I was a teenager. It also so happens that State Farm sponsored a “Best of” the Jack Benny radio show from 1956-1958 and sponsored his TV show from 1960-1965. During these periods, State Farm Agents were able to capitalize on the popularity of the Jack Benny Show to help sell insurance products. To help roll out this marketing partnership, an LP was produced for State Farm Agents. The record was called “Music to Write Apps By”. (“Apps” is insurance lingo for an insurance application.) 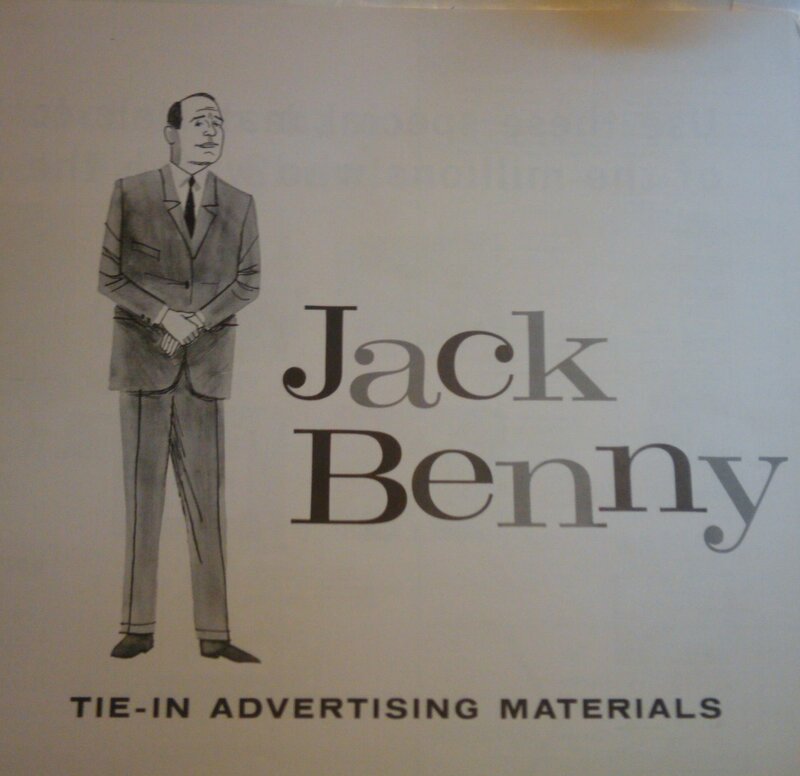 It also included an inserted order sheet of Jack Benny promotional items. 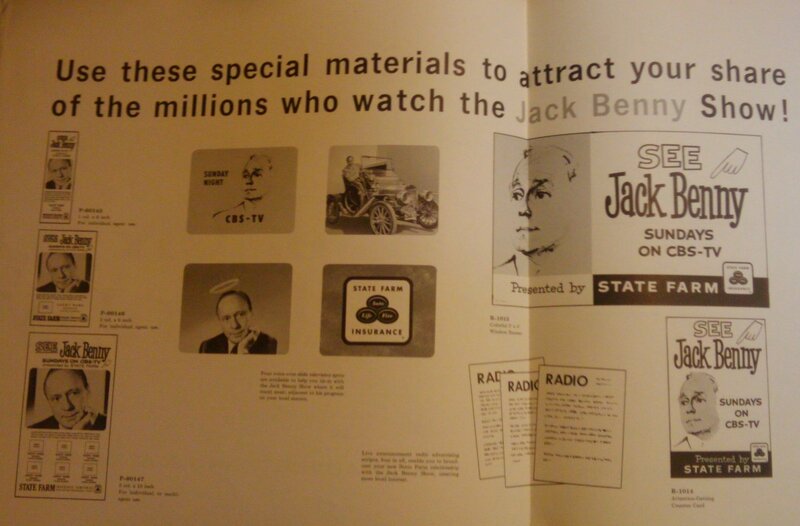 The album featured a special recording of the Jack Benny radio show designed to highlight State Farm’s new sponsorship. The flip-side was a collection of the State Farm theme in a variety of musical styles. In talking to our company historian just recently, I was informed this album is something of a rarity. This past weekend I spent some time rummaging through a used record store called Charlemagne’s in Birmingham Alabama’s Little Five Points. 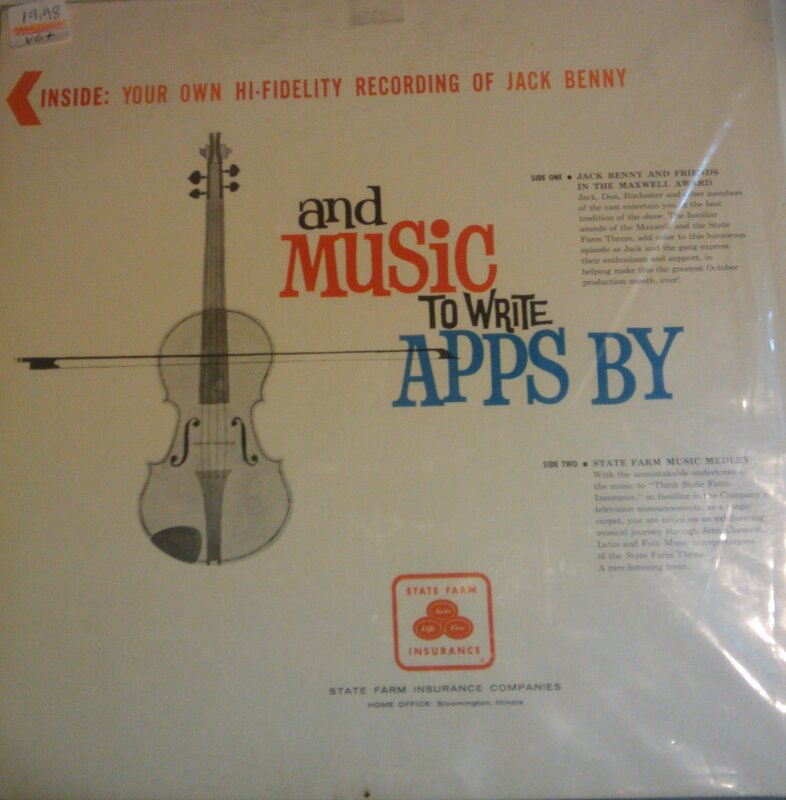 To my pleasant surprise, I ran across a pristine (VG+) copy of Music to Write Apps By for $20! Needless to say, I bought it. I was pleasantly surprised. While there is only a single LP, it’s in a double album cover. It opens up to a layout of promotional material and the insert I mentioned earlier. 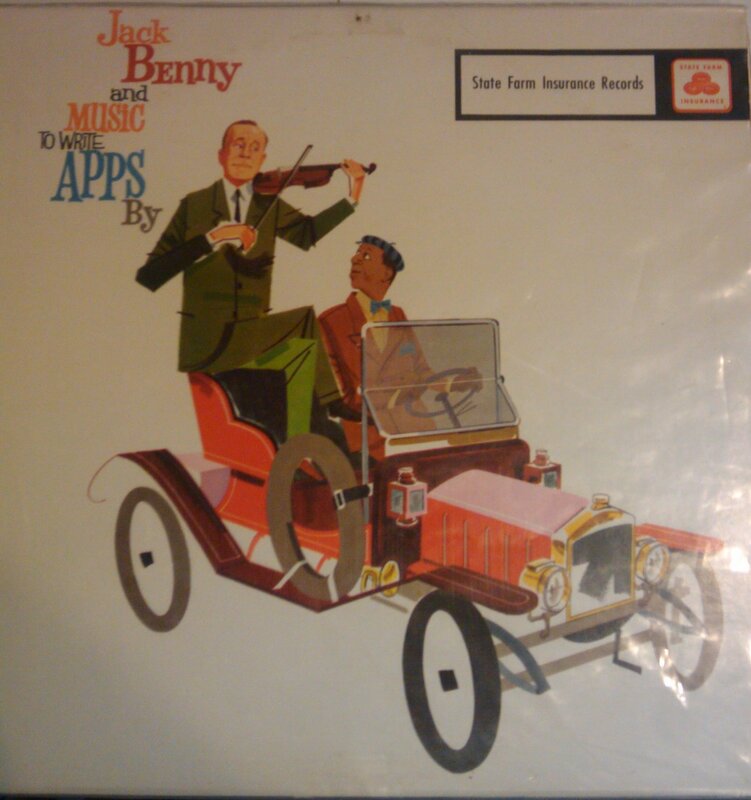 The radio show is classic Jack Benny complete with Rochester, Mary, Don Wilson and the great Mel Blanc! If there is any radio recording that belongs on a blog called “Lost Transmission”, this is it! This one’s going in the vault, folks.